Hi everyone!! Today I am going to share a new product with you that I adore! So...have you seen the beautiful new twine that The Twinery has released recently? 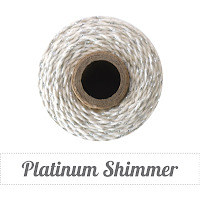 SHIMMER twine!? Swoon!! It is gorgeous! It is fabulous! It is so pretty & so sparkly! I love it! I put together a winter themed project for one of the shelves in my dining room. It needed a little sprucing up! 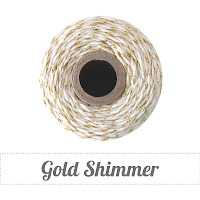 I used my twine to make a banner of sparkling snowflakes! I LOVE how the shimmer in the twine works so well with the shimmer in the glitter paper that the snowflakes are cut from! It adds just the right touch to my family themed shelf! It was so easy to create this! I just die cut several snowflakes with Lil' Inker Designs Snowflake Dies and then used glue dots to attach them to the Platinum Silver Shimmer Twine. Be sure to grab yours today in the Twinery Store! Thanks for stopping by today! 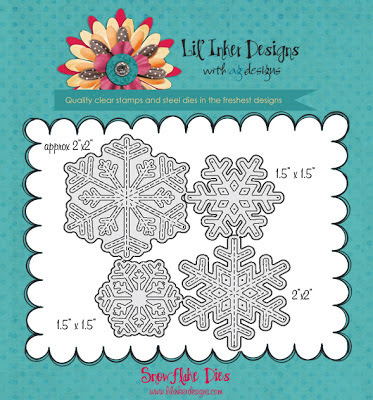 And, if you love those snowflakes, you can snag those dies (set of 4) at Lil' Inker Designs! They are wonderful!! Thanks for stopping by today! I hope you had a wonderful Christmas! Welcome to December's PTI blog hop! The challenge theme this month is white on white. We were challenged to make a card using mostly white and were allowed to add just a pop of color. I kept it Clean & Simple. I impressed the background with the PTI Simple Stripes impression plate and used a doily as the focal point mat. I popped the Stitched Mats Frame: Squares from Lil' Inker Designs up on pop dots to frame the entire card (love those squares so much!!) and then used the PTI Hearts Frame die to make the glittered hearts. I love how the little pink pop of color rounds everything out! Thank you for stopping by today! I hope you enjoyed a very Merry Christmas! To see others who are participating in this hop or to play along yourself, visit Nichole's blog. Welcome to Day 3 (the final day) for the Lil' Inker December Release! If you are following the blog hop you should have come from Amy's blog! To start at the beginning, visit Laura's blog. First up today, is a little cream card. I used the 4x4 Stitched Mats Squares die. These dies are wonderful!! 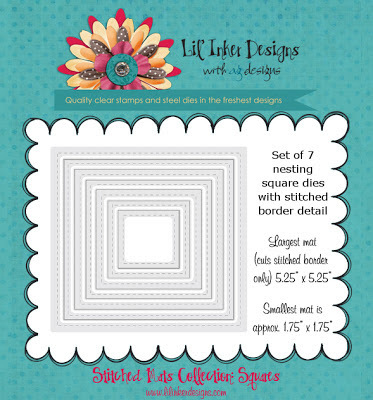 You get a set of 7 nesting square dies! If you enjoy making square cards, these dies are PERFECT!! 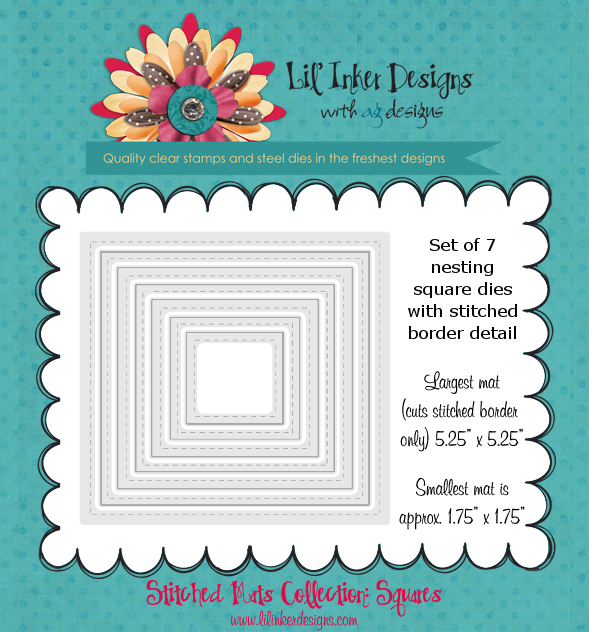 If you like to layer using squares, these are perfect for that too! Lots of fun uses! 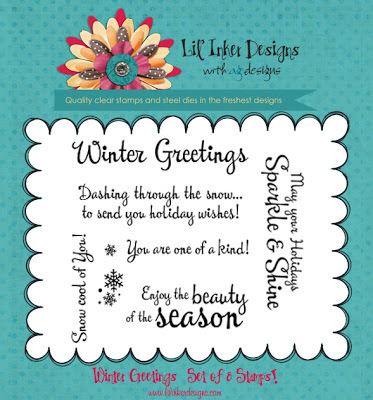 The sentiment is from the new Winter Greetings stamp set. I stamped it onto the LID Double Ended Banner die. I cut one of the snowflake images out of the square and then popped up the smaller of the snowflake images on top of the die cut. I also die cut two more of the same snowflakes with the same vintage cream cardstock and glued them onto the cardstock. I love the way the snowflake images look like that! This second card is an exact replica of the card above, just in a totally different color scheme. I used the other set of snowflakes shaped dies for this card and layered them onto the square met. I just a glittery rhinestone in the center of the snowflake for extra pop. These snowflake dies are so amazing! The stitched detail is AWESOME!! You'll LOVE it!! Thanks for joining me today! To continue on in the hop, visit Karen's blog! Be sure to leave comments along the way because there are two $10 gift certificates up for grabs to one secret commenter along the way! Hello!! 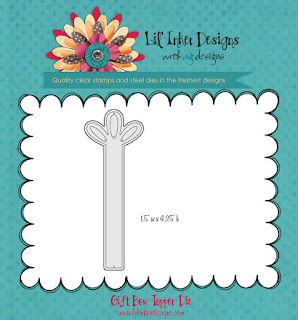 Welcome to another FABULOUS release from Lil' Inker Designs! I can't wait to share with you the new products that are releasing this month! Hold onto your seats, you're going to love them! If you are following the hop, you should have come from my good friend Amy's blog! If you would like to start at the beginning, visit Laura's blog! Ok...so remember those wonderful, wonderful rectangle stitched mats from a release a few months back? Well, now we have Stitched Mats: Squares!! Yep!! They are equally as fabulous and fun and versatile! For today's project I made a window card. This is the front of the card with the window closed. I used two sizes of the stitched mats squares dies. One to make the "frame" on the front of the card and one to cut the window and make the inside layer. Here is the inside of the card. 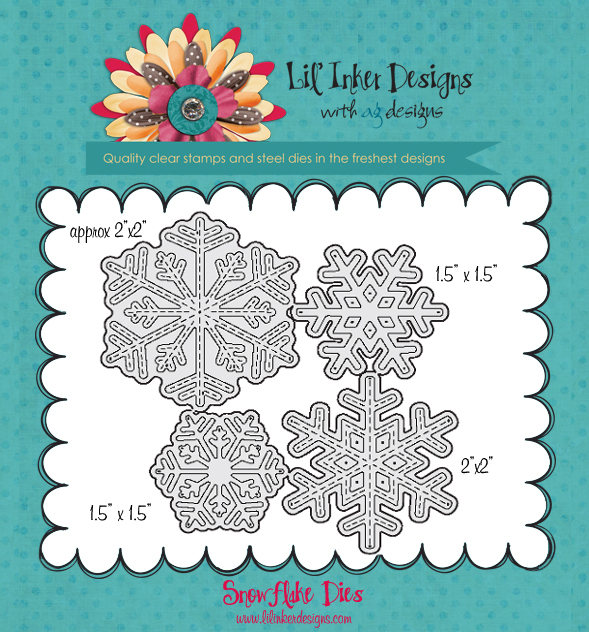 Ahhhh....how gorgeous are the new snowflake dies? FABULOUS!! There are four in the set of dies, 2 of each shape, one small and one large. LOVE!! They are so beautiful and delicate and I LOVE how they look die cut from glitter paper! Here is a closeup of the square mat and the beautiful snowflakes. I put a piece of the ever-popular flair in the center of the snowflake for a little more pop. Have you seen that flair popping up everywhere? Even at JcPenney's! They make great card accents! Would you like to see all the new product photos? Each of these items are available in the store now! Now to continue on in the hop, you can jump on over to Karen's blog! Be sure to leave a comment and let me know what you think! That gives you a chance to win one of two $10 gift certificates to the Lil' Inker Designs store! We’ve gathered designers from some of our favorite manufacturers to show you ways to create something from the heart this holiday season. This 3 day Hop includes over 60 stops with inspiration brimming from every corner. Explore all of the thoughtful and beautiful handmade gifts you could create for the holidays, all in one place, during our second annual Handmade Holidays Blog Hop! You should have come from Natasha Naranjo Aguirre's blog! If you would like to start at the beginning, visit The Twinery's blog for a full list of participants! This was such a fun project! 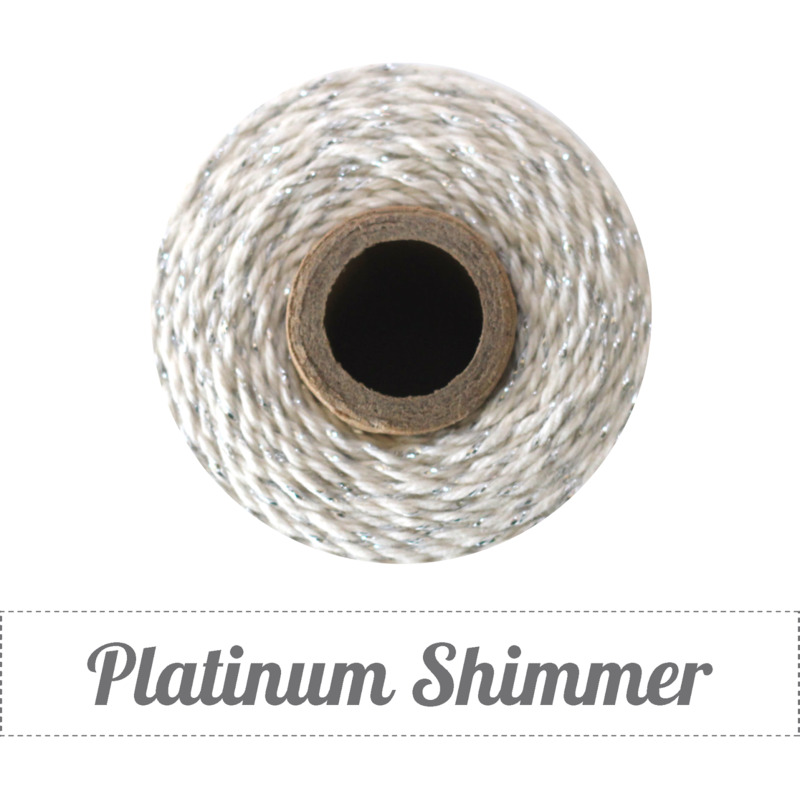 I had the privilege of working with products from The Twinery, Fiskars & Tombow! Let me tell you that was a great combination! For my handmade holiday gift idea, I created a set of four Christmas tree ornaments that also double as gift tags. I'll share how I did this in a tutorial below, but first off here is what they look like. Here's three of the four tags hanging on the tree. For this tag, I used the beautiful Seaweed Twine for the branches, Cappuccino Twine for the tree stump & Buttercream Twine for the little star on top of the tree (which I made by tying a French Knot). I used Maraschino Twine to hang the ornament tag. I'll show you an easy way to create a similar tag below. I took a little different approach for the next two tags. I stamped on the canvas, attached the snowflakes, that were punched with fabulous Fiskars punches, with Tombow adhesive. (For the two tags that I stamped on, I purchased pre-cut & pre-sewn canvas tags at Hobby Lobby. On both tags I added a glittered border that was punched with Fiskars Lacy Doubles border punch. It is such a pretty punch design! Now I want to show you an easy way to stitch designs for your tags/ornaments! After it went through the machine, it left an impression of the star on my canvas. I like doing this as opposed to using a pencil to draw lines because you won't be able to see these lines when I'm done, but it is hard to erase pencil lines on canvas. I then threaded my twine through a large eyed needle and began to sew the star following the pattern I had created. Then, I stamped a sentiment on the bottom. Next, I took another piece of canvas that I had cut to the same size and sewed the pieces together. This is to hide the stitches on the backside of the tag. I then punched a few of the Fiskars snowflakes out of yellow glitter paper to add to the tag with the Tombow adhesive. The next step was to distress the edges of the tag using ink. I then added an eyelet with my Crop-a-dile and tied the Maraschino Twine through the hole. This is what the finished tag looks like on the tree. And, since you've sewn the two pieces of canvas together, this is what the back side looks like...nice and clean! I hope you enjoyed this project & tutorial! It truly is an easy gift to make & give! 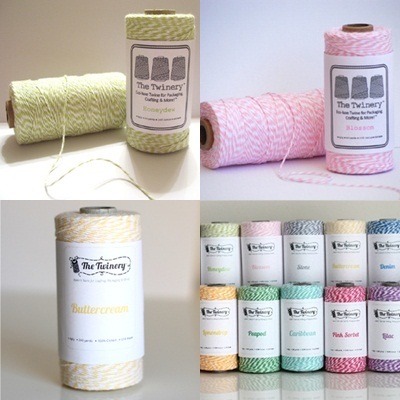 The Twinery is offering 3 spools of the winners choice $48 value! Visit The Twinery for a complete list of blogs and leave a comment on each by Nov 27, 2012 at 11:59 PM PST. Each day we will be sharing a brand new list of blogs with brand new projects for you to explore, be inspired by and create from! Your next stop on the hop is to Laura Denison's blog! Hi!! 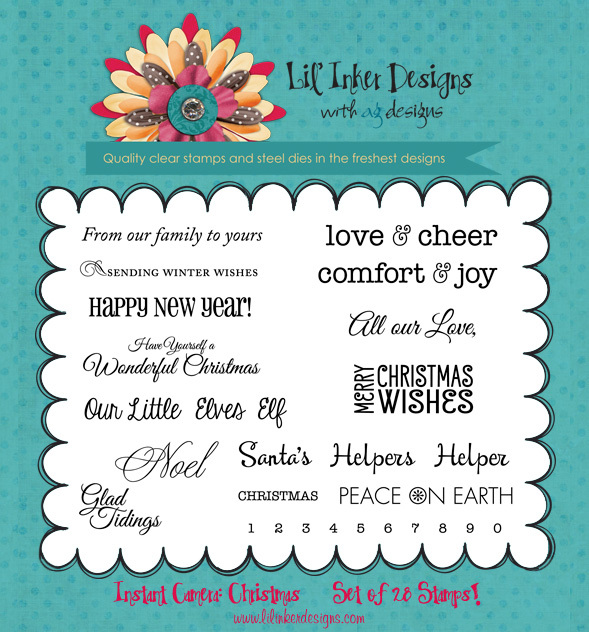 Welcome to the wrap-up post for Lil' Inker Designs November release! Hasn't this been a fun-filled week? 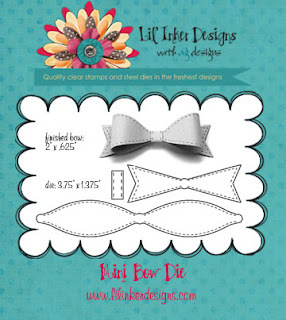 If you are following the blog hop, you should have come from the Lil' Inker Designs blog! Be sure to comment on the blogs along the hop, because there are FOUR gift certificates to the Lil' Inker store to be given away and to be eligible to win all you have to do is comment! I have one more project to share with you today using the new products released this week! As always, it also has a twist! This card uses the new Instant Camera Christmas die & sentiment. I cut the frame out of white glittery paper. I love how that turned out! Then, the picture is from a piece of patterned paper that I picked up at Hobby Lobby. It was so simple to create this! I stamped the sentiment that uses such a beautiful font, on the paper. And what about that tiny little glittery bow? I love how this bow looks made out of glittery paper. What a super cute and easy way to decorate up a card front! ...it can easily attach to a refrigerator or a metal pail, file cabinet, etc to make a cute little accent! This would be a GREAT way to send a family photo! I always enjoy hanging pictures of friends and their family on my fridge when I get them in the mail and if you send it with a magnet already attached, you've made it that much easier to do! And you almost ensure that it won't get thrown away! Now, I get to send you on to one very special gal's blog, Amy Kolling! Thanks for stopping by! Don't forget to leave a comment for a chance to win! 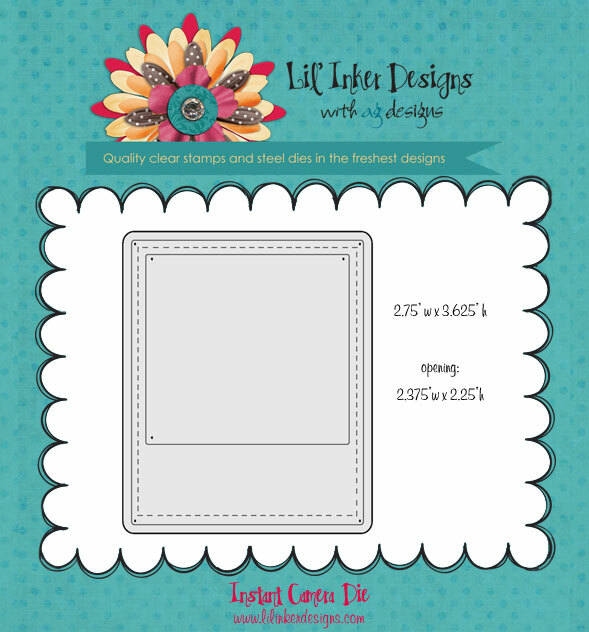 Welcome to release day 3 of the Lil' Inker Designs release! 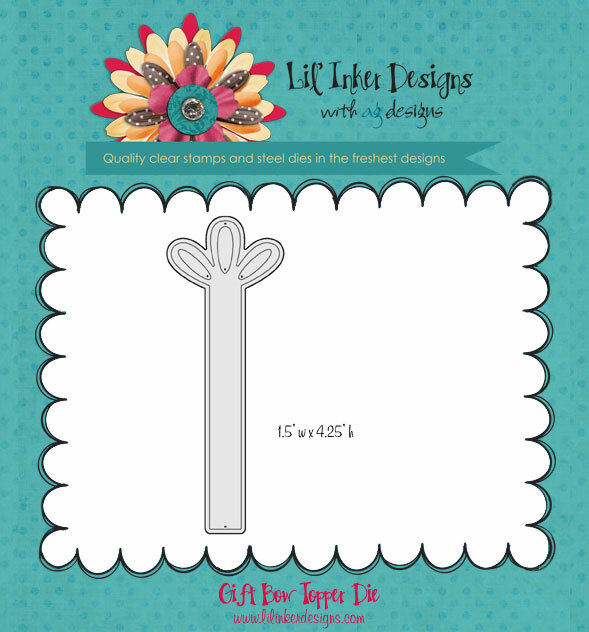 If you are following along in the hop, you should have come from Lil' Inker Designs blog, it is the first stop on the hop today! First off, I die cut 25 of the instant photos using various types of pattern paper which I mixed and matched. Then, I applied the numbers (you could use dies or stickers, etc) for each day in December leading up to Christmas. After decorating each instant die, I clipped them onto a cord that I had stapled onto the back of the wood frame (from Hobby Lobby). The clips I used are hair clips that I found in the jewelry section. They worked perfectly! For this section I used the Of the Heart die (#12), the Jingle Joy bell die (#17)﻿, the Holly Jolly holly dies (#21) & the new mini bow die (#24). Here it is...this is what the back of each day looks like (I just turned the calendar around so you could see all of the pictures). I've attached a favorite photo from the year onto the back of each card. Each day that the kids take a number off of the calendar, we will talk about the blessing on the back and reminisce about the special times we had throughout our year. I tried to pick a variety of activities and special photos to highlight and also things that would get the kids thinking about how those times were blessings and gifts from God during the year. I have one more way to use this idea. Laura designed the dies so that they can be ornaments and hung with twine/ribbon. I made a few examples similar to the calendar above, only this time I put the photos on the front of the frames and attached the Gift Bow Topper die to it so it can easily hang from the Christmas tree. Here is one of the pictures. You might recognize this from the calendar above. I LOVE this picture. It is a picture of my son's shoes (from May 2012, the date is stamped on the bottom right-hand corner with the Instant Camera: Christmas stamp set) and my daughter's shoes INSIDE his! I loved how it showed their size difference! I also stamped a "1" in the left hand corner to continue on with the countdown theme. One more example. Date on the right-hand side and the countdown number stamped on the left-hand side. I hope you enjoyed this project! Thank you for staying with me through the end of the post! If you decide to make a blessings calendar, I'd LOVE to know about it (and see pictures too if you take them!). Be sure to leave a comment! Just by leaving your comment, you'll be eligible to win one of two $10 store credits! The more blogs in the hop you comment on, the better your chances are of winning! To continue on in the hop, please go say hi to Alyssa! 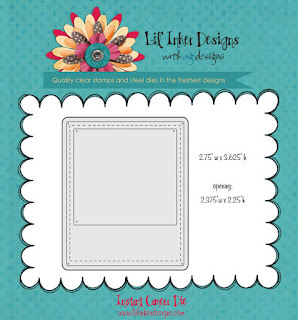 She will be feauturing some other new Lil' Inker products today! Don't forget, these products are available now, so hop on over to the Lil' Inker Designs store to check them all out! Thanks for stopping by! Come back tomorrow for another release post...pssst...I can't wait to share this one with you!